Whitley Hall Hotel features some amazing rooms containing original features and period furniture. Whenever we photograph in surroundings like these we feel it is important to try to include as many of the details as possible in the images; there is little point getting married in such magnificent surroundings then not taking full advantage of them! 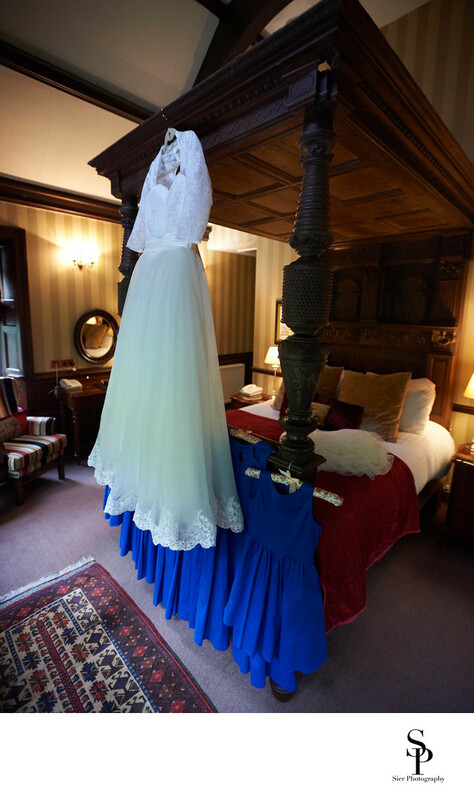 The fantastic four poster bed in the bridal suite is really something else and provided the prefect place to hang and beautifully display this stunning bridal gown. This was a lovely wedding with a truly lovely couple who were so nice to be around and such fun to work with. Wedding days can be hard work for the bride and groom, their friends and family but also for us and it really helps to have a relaxed and fun group of people to be around. Whitley Hall Hotel is located to the North of Sheffield and has easy access to the M1 motorway and is within easy reach of Sheffield and Barnsley as well as most of the North of England. We have further weddings booked for this venue and we can't wait to get back there and do some more exploring. 1/200; f/2.8; ISO 3200; 17.0 mm.